The Santa Rosa Quilt Guild was established in 1976. The guild is a 501(c)(3) non-profit organization (TIN #94-2422442) dedicated to preserving this country's quilting heritage through the education and enhancement of quilt-making skills. Our members share a love of quilting and all things quilt-related and welcome those who have similar interests. We have grown from a small group of founding members to more than 280, and are still growing! To learn more about becoming a member, please contact us. Meetings start at 10:00 a.m. and last approximately two hours. You may want to extend your time and enjoy the optional activities after the meeting. Bring your lunch and coffee mug. There is water for coffee and tea available, and members bring goodies for a buffet table. The business of the Guild is usually conducted at the first meeting of the month, during which we hear committee reports, with a time to share projects during Show and Tell. The second meeting of the month is usually a program meeting or special event. The December meeting is a holiday potluck. BASTING SUPPORT Help with quilt basting and tying after meetings is available upon request. BLOCK-OF-THE-MONTH At each business meeting, a new block pattern and directions are made available. Members may make one or more of the blocks to be returned for display the following month. One (or more) lucky participant is chosen by drawing to win the completed blocks. On occasion, the Block-of-the-Month Committee might request that blocks be made for a specific project, such as Wounded Warriors. CHALLENGE If a member agrees to coordinate it, the Guild will issue a challenge. The rules vary each time. Approximately six months later, the projects are displayed at Show and Tell. COMMUNITY PROJECT QUILTATHONS The guild makes and donates quilts and baby caps to organizations in our community to be given to the less fortunate. Quilts of all dimensions are donated to various organizations, depending on the specific needs. Several times a year quiltathons are held to work on Community Quilts. These are scheduled during regular meeting times and on 5th Thursdays. All members are encouraged to participate in machine quilting, hand sewing of labels, pinning, assembling quilt sandwiches or just encouraging others who are doing the hands-on work. 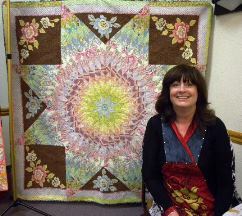 Community Quilts is a major emphasis for the Santa Rosa Quilt Guild. In 2013 the guild donated over 1200 quilts to deserving organizations and individuals. DISCOUNTS Several of our Affiliate members offer discounts to Guild members. These discounts vary, so carry your member-ship card and check with each vendor. For a list of affiliates, click on Home in the menu on the left. FRIENDSHIP BLOCK This program is based on the rich history of friendship quilts in the United States. One member chooses a pieced or appliqued block pattern that is distributed to other members to construct. The blocks are to be returned in one month. Each recipient is expected to pay back the number of blocks received by making blocks for others. LIBRARY We are privileged to have the most extensive quilt related library in the world -- close to 3000 items -- books, plus periodicals, patterns, DVD's, templates and rulers. NEWSLETTER "Stitch 'n Times" is a handy reference for upcoming programs, the status of ongoing activities and the newest library items. To see the newsletter in pdf format, click on Newsletter in the menu on the left. PROGRAMS Our guild has several featured speakers each year at program meetings. These talented and interesting speakers are specialists in varied aspects of the art of quilting, and frequently conduct a workshop the following day. For details of our programs click on Programs/Workshops in the menu on the top. TECHNIQUE SHARING WORKSHOPS Periodically, mini-workshops will feature members of the Guild who are willing to share a favorite technique or expertise. There is no fee and this is a terrific way for new quilters to gain knowledge and skills. Details about upcoming TSW's can be found via the TSW link at the top of this page. WORKSHOPS BY NATIONALLY RECOGNIZED QUILT ARTISTS Workshops with talented instructors are usually held on the Friday morning following the second monthly meeting. They offer a wonderful, inexpensive opportunity to learn new techniques. There is a fee for the workshop and it is important to register early. For details of our programs click on Programs/Workshops in the menu on the top. For more information about becoming a member, contact us.